Happy holidays everyone! I hope you all have a safe and happy New Year celebration this weekend. As for me? I'll most likely be bundled up by the fire waaay before midnight. It's friggin' cold outside! What to do when the temps are frigid? 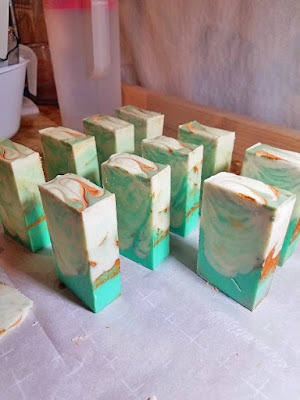 Make soap! Actually, I am dialing down-down on my soap formula to find "The One". 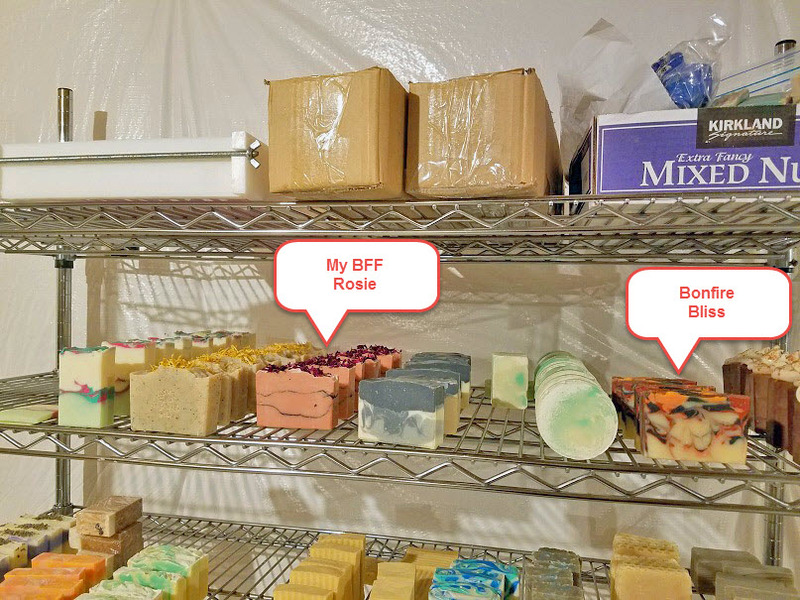 From "Bonfire Bliss" (red/black/orange soap on the far right in pic), each one of these bars include one-tweak-to-another to get to my perfect bar of soap. What makes my "Perfect Bar of Soap"? I want it to be a high-quality, nice conditioning bar. I want it to be a hard bar that I can unmold in 24-hours or less. I want it to be flexible as far as design. I don't want to have to struggle with annoying soda ash afterwards. What I've done is added some yummy butters like cocoa butter, Shea butter, and mango butter. 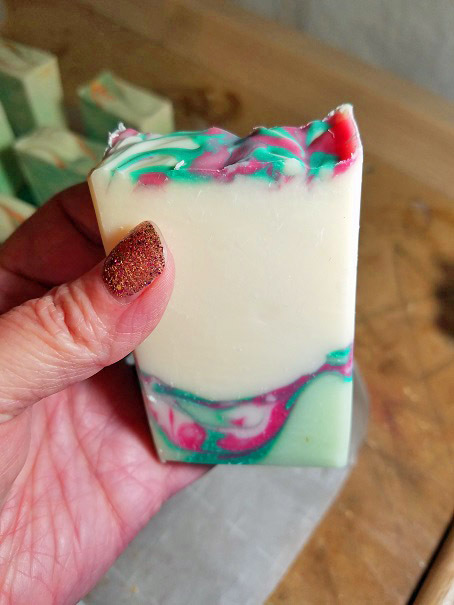 I've increased what is called my "superfat" in my recipe - meaning I've increased the percentage of oils/butters in my recipe that WON'T saponify (turn to soap), so my bars have more free-floating conditioning-oils to make the skin feel super-soft. And, I've added just a smidge of beeswax to help control soda ash, which it has been doing spot-on. The colors are poppin! "Beautiful Day" - Dig my glitter nails! So, right now we wait and see. 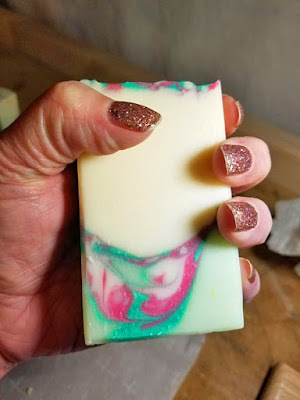 Since cold process soap takes 4-6 weeks to cure, it's a waiting game, and I don't want to get too far out in production to only find I don't like what I've made. Rosemary Mint w/Gold accents colors - St. Patrick's Day? 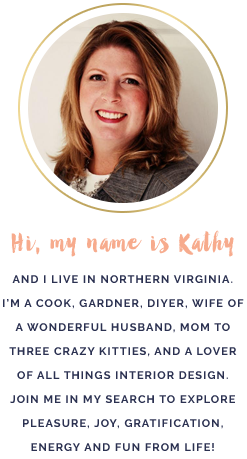 "My BFF Rosie" - Are you THE ONE? So, it's really a "what if I add this and not that?" situation. Why not make all my bars just like "My BFF Rosie" then? Well, because I don't know if it's my oil/butter combination or the other ingredients in that bar that makes it so special. So, we make different combinations of ingredients to see what works and what doesn't. These look awesome!!! What a great hobby.